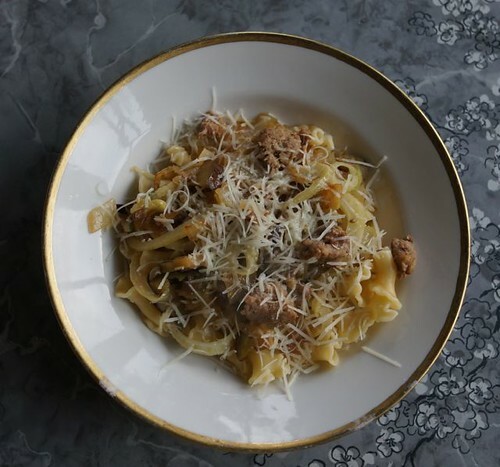 While I am slowly getting back to normal cooking after a fun filled summer with the grandkids where most nights we had easy unplanned dinners, I have started back menu planning for at least 5 days out of the week. My first day back I chose to make a quick chowder from the issue 119. I had 3 dozen little neck clams to steam so I added them to to chopped chowder clams and just tweaked the seasoning a bit. All in all a tasty bowl of chowder and certainly a little less time consuming than the pot of Jasper White's that I normally make also tweaked by adding in leeks, fennel, and seasoning to taste. So I'll report back with other notes from other recipes in the issue, I have to go back to read the turkey recipe, sounds really good, but what isn't when wrapped in bacon? That chowdah looks great! ICD, glad to hear that you had fun with the grandkids but life is returning to normal. I hope you do try the turkey-- very different from the usual roast turkey served up by all the cooking magazines every November! The new issue (119) looks really good. 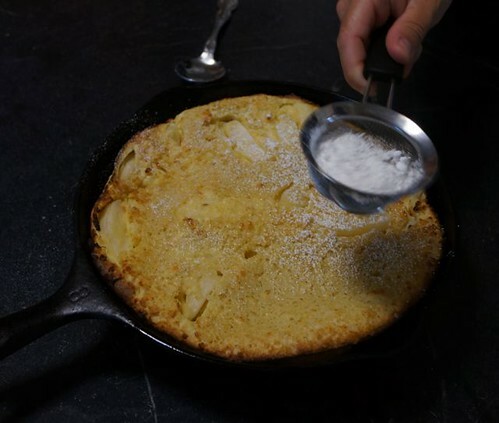 I still haven't made the plum clafoutis from 118, but this morning I made the pear pancake (from the cast iron article). In the same vein, it's fruit and custardy batter baked up nice. I've made a similar apple pancake before, but this one was tasty-- I like the pears and the nice bit of lemon zest in the batter. Great breakfast, I served it with maple syrup! That looks pretty good! A little fall weather has come our way and I'm ready for it after such a hot summer. I have several things on the menu planner from FC and I'll report back. I made a few recipes from Bon Appetit as well. My daughter has relocated to DC so I will be seeing the kids more often. I returned them to mom Labor Day, our first train ride was so much fun and more than likely will do that again. There are now direct flights from our Jacksonville airport to Reagan which make it so nice and reasonably priced (non-holiday) instead of the 8-12 hour days spent traveling to AZ or Idaho. I've been leafing through my issue a lot-- it looks great and it's supposed to cool off this week. If good intentions were sufficient, I would have a lot more to post-- I bought the ingredients for chicken cacciatore twice, but ended up getting lazy and cooking them by different means. I'm totally nuts for Dorrie Greenspan's Roast Chicken for les Parreseux (the lazy), which just involves a lot of garlic. But now it's time to get cooking! We're enjoying an extension of summer here, as our public school teachers are on strike-- so today we went to the beach! ICD, that is great that your grandkids are in DC-- so close and a fun place to visit too! kg, I look forward to seeing what you post! I just got my issue late last week and after a very busy weekend I have hardly had a chance to flip through a couple of pages. I love that photo of the pear pancake pie! yum! ICD, so nice that you have your grandkids much closer to you. It will be so special for them to have you around. Made it, loved it! We had some tasty lettuce from the CSA, so used that instead of escarole. Also threw in some fresh tarragon, which was excellent with the cheese and apples. I didn't have hazelnuts, so used pecans. Hard to go wrong with blue cheese and apples! It's been cold here, so I've started doing a little more baking. 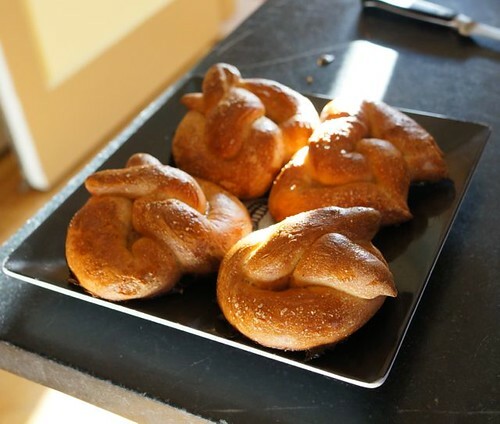 These pretzels were yummy and lots of fun. The kid helped me twist them-- we also experimented with non-traditional shapes with limited success-- you might be able to make out the pair of linked hearts in the upper right corner. I love that you freeze these un-baked, then dip and rise as you like. I'm going to try these for an after-school snack. The kid was not too excited about the first batch, but I overcooked them a bit. I didn't feel like buying food-grade lye, so I just used baking soda with a bit of barley malt syrup to increase the color-- I happened to be making bagels this week and I just used the same dip. Hey kg, one good thing about bread is if you mess up, then it's only flour and water, not some super-expensive ingredients! I would say if you have a stand mixer and a kitchen scale, you should be okay. Give it a try! This dough seems to be quite forgiving! In the meantime, I have another recipe to report from 119. I tried the updated chicken cacciatore and it was excellent! It was a bit chef-y, needing a lot of ingredients and generating a lot of dishes, but so yummy. It's really kid-friendly too, because without the sauce, it's really just chicken fingers. The sauce is just roasted peppers, mayo and garlic-- that was good stuff, I would have that on a sandwich or grilled fish-- maybe with a touch of hot sauce in there for zing. I didn't feel like acquiring another grain, so I used barley instead of farro-- my pantry is crowded enough! I bought a whole chicken and used the white meat for this-- tomorrow, I'm making the other chicken cacciatore (the classic) with the dark meat! This is the perfect time of the year to cook-- I love fall! And the light is still good for photography at dinnertime! Tonight we tried the classic chicken cacciatore and it was also delicious, but very different. 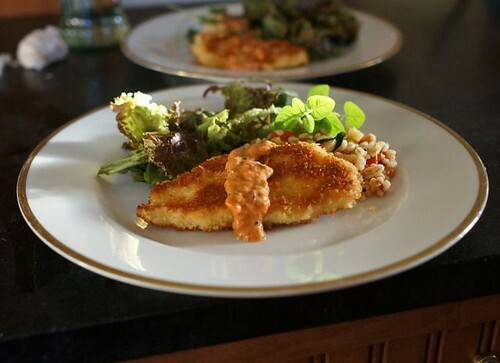 This makes a rich tomato sauce and tender, flavorful chicken-- the whole family loved this one too, although the kid voted for yesterday's updated recipe because of her love for fried chicken fingers. The classic cacciatore was a bit easier to make, although browning the chicken was a spattery mess. I think taking a whole chicken and getting two different dishes out of it by using the white meat for the update and the dark meat for the classic was a very good bet! It's a tie, make 'em both! Served with spaghetti because we're American! I gave it much thought and decided not to make them so let me know if you make them. So far I have tried the thai turkey (chicken) soup, the carrot salad with cilantro dressing, roasted green beans with sweet potato as well as the sausage and penne dishes. 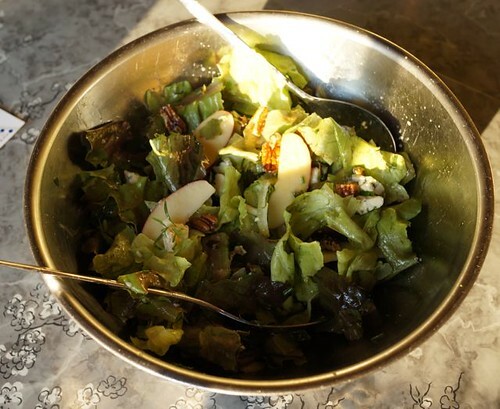 I absolutely loved the carrot salad, it was fresh and light and it was a great way to have a nice side dish. The penne with sausage and fennel was ok, not my favourite but it was a nice combination with the fennel and the sausage. I don't have any turkey left overs as of yet so I made the thai soup with chicken. I used baby bok choy because I find the regular one a little too bitter. It had nice flavour but I made it with store bought stock so it needed something else for oomph. The green bean and sweet potato dish was really good and so easy to throw together! Hey kg, you've been cooking up a storm-- that carrot salad sounds good and I just got both carrots and cilantro in my CSA box this week. For my part, I did try the chocolate cake from the make-ahead dessert article and I was disappointed. It was a decent cake, very serviceable, but for all those ingredients (two cocoas, two sugars, butter, oil, sour cream, coffee, this, that), I expect something special. We generally make Abby Dodge's Emergency blender cupcakes, which have all the chocolate punch for about 1/10th the work! As a caveat, I didn't make the ganache frosting, which would have added more chocolate-- I was out of cream, so I just made cream cheese frosting. Good but not great. Thanks for the photos-- I look forward to seeing what you've cooked up! oh, that's too bad about the chocolate cake. My girlfriend's 30th birthday is next week so I was actually considering making that cake. But that is not a glowing recommendation. I was also thinking of making these chocolate cupcakes instead. I wondered why it is that cupcakes are not made to mound high on the mould? does it have anything to do with the frosting or the chemistry of it all? I think I will try the pretzels...maybe in a couple of weeks as I have Thanksgiving this weekend. Well, I think if you made the ganache frosting, the cake would be awesomely chocolatey. Plus, it really was better after a few days-- so they were not kidding about it keeping well. Cupcakes are always good too-- do you have the emergency blender cupcake recipe? It's really good and easy too. I'm not sure why most cupcakes are flat-- maybe so you can pipe a gigantic mound of frosting on top (yikes). Hey, Happy Thanksgiving! Are you cooking? Turkey? Hey kg, I tried the penne recipe and really liked it-- but I am totally nuts for fennel. My husband liked it too, but the kid was dubious! We usually have marinara, pesto, or cheese sauce, so this was different-- in a good way according to the adults! I had an eggplant that needed to be cooked or tossed from my CSA box, so I threw that in with the onion. Also, I browned a whole pound of sausage and saved the extra for pizza later in the week! It came together really fast, which made me happy-- the eggplant was a good addition-- maybe a little more sauce to coat the pasta would have been good. I had some leftover sausage-fennel-onion mixture-- I'm going to put that on my pizza! Funny you should comment on my dishes since I always look at my dishes and yours and think YOU have much prettier dishes than I do!! Glad you liked it. I like fennel too but I think it was the fat in the sausage that didn't sit so well with me. I liked it ok, it just wasn't my favourite. And yes it was definitely a quick dish, never a bad thing during the week! No, I'm not cooking. I got off scot free this year!!! It is a family dinner of 20 ppl and we distribute who brings what but this year apparently there were more volunteers than usual so by the time I got around to signing up there was nothing left! It is a sleep over and again for the breakfast sign up I was too late...but I think I'll make granola and home made yogurt to bring. The breakfast menu has eggs, french toast and bacon on it so I thought something a bit lighter might appeal to some. Ha, you like my dishes because you can't see all the worn spots! 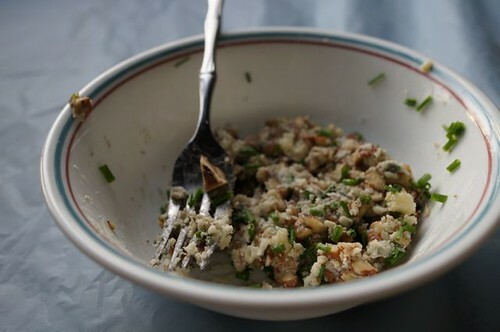 That is a good point with the fat in the sausage-- I happened to have some very lean farmers' market sausage, so it wasn't too greasy-- plus the eggplant soaked up any and all fat in the dish anyway. As for T'giving, I hope you have a great one and enjoy everyone else's cooking! Yogurt and granola is a great idea-- people (at least some) will appreciate something lighter! Here is the apple-parsnip soup (http://www.finecooking.com/recipes/curri...), which was smooth and delicious. I love a creamy curry soup. Just make sure you have a dry vermouth-- I didn't realize that mine was a bit too sweet until after I added it-- with the apples, etc,. this doesn't need any more sweet. I served it with blue cheese crostini, a very good match with the sweetish soup. My soup is orangey because I probably added too big of a gob of tomato paste! My husband sent this recipe over the top by adding a good blorp of Thai chili garlic sauce-- that was outrageously good. 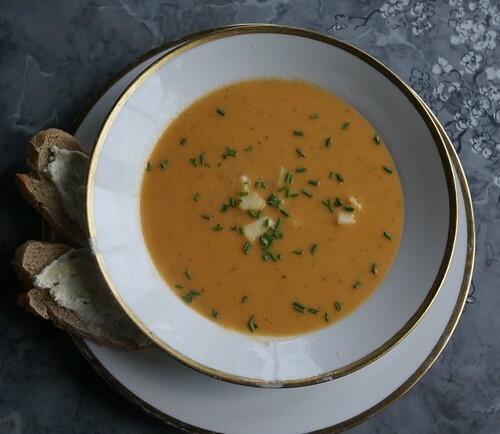 Edited to add that if you make this soup, you should make it a day or two in advance-- I brought the leftovers on a camping trip and it was really improved! At top left is the cider-glazed chicken from the Make it Tonight section. (http://www.finecooking.com/recipes/cider...), which was quick and easy and delicious. The glaze was a bit subtle on the chicken-- but added a little sweetness and made for a nicely crispy skin. The glaze is reduced cider, honey, and a bit of butter swirled in-- on its own, it was really amazing-- it would be great on crepes. I ate the remainder out of the pan with a spoon. And the other recipe is Ellie Krieger's maple-orange cranberry sauce (http://www.finecooking.com/recipes/orang...). Now I generally make a simple whole-berry sauce by boiling the cranberries with sugar and water, but I looked at this recipe and thought it wouldn't be much different, given the assertive qualitites of the cranberries. I was particularly worried that it would be a waste of maple syrup, which ain't cheap. I was very surprised by how tasty this was-- the orange and maple gave it lots of layers of flavor. I'm sorry I only made a half-batch, which my husband and I just about polished off! So, another great meal from this issue. I'm really enjoying issue 119-- but I leave the smoked turkey to ICD-- that is way too much for me! I have been so busy lately and haven't planned much of anything on the grill/smoker, but when I do, I'll let you know. I'll have to really plan as two of us don't want to eat turkey for months. YUM! I made the puff pear pancake this morning and it was heavenly! I had my friend and her 4mo old baby over for breakfast so since the baby was sleeping I whipped the eggs by hand best I could. The pancake turned out wonderfully and I think it was cooked just right. The center was a bit like a custard, is that how it was supposed to be? or was that a sign of it being undercooked? It wasn't too sweet and I love the pears. I think next time I might add ground ginger to it or maybe cardamom would be nice too. Actually, my husband's family always cooks their turkey in the oven wrapped in bacon but then there is the fight of who shall get to eat it :) He was dismayed that the instructions said you could discard the bacon should you not want to eat it :D it made me laugh. Delicious looking! I haven't had much luck with pears lately, but apples galore. One of the CTC members shared an apple butter recipe that I'm going to make...Apple Butter. I was going to shoot for the smoked turkey over the weekend, but a lot of plans interfered with that and I ended up "smoking" the porchetta turkey roast adapted from and FC turkey breast porchetta instead, still and all a winner. I actually took apart a prepared turkey roll and seasoned porchetta style, reassembled and covered with pancetta, lightly smoked for about 2 hours (155°). It was delicious and not a ton of leftover turkey, just enough for a couple hot turkey sandwiches, perfect. 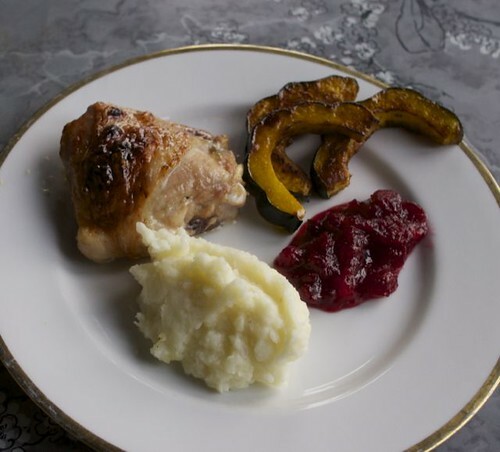 Great version for a small Thanksgiving as it has both light and dark meat and I suppose you can change up the seasonings for a more traditional flavored turkey roast. Roasted sweet potatoes were very good with the turkey and a few homemade biscuits to sop up the pan juice sauce. I might try the updated version for the cacciatore so I'll get back to you guys on that later. Your food looks great! 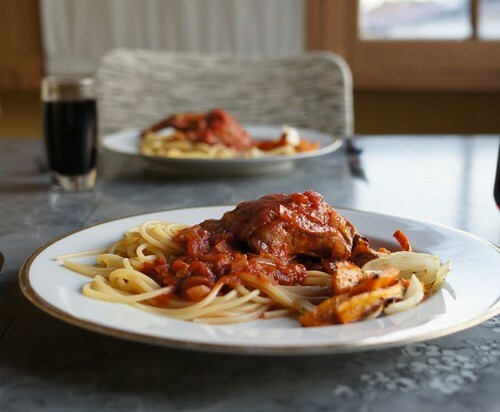 I liked both cacciatore recipes, so I'll be curious to hear your take on the update. The pear pancake looks good too! 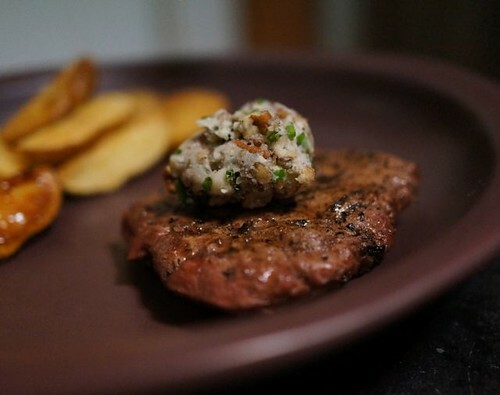 I didn't have a tenderloin steak-- and I don't truck much with tenderloin anyway, as I prefer more meaty cuts of beef. So I used a NY Strip steak. We grilled the steak and I let it rest a little too long before putting on the butter, so it didn't get all melty-- but it was really an amazing combination-- and so easy to make! I'm going to make the butter itself-- maybe with some cream cheese, as a cheese ball for the next time I need an appetizer! It would be perfect with martinis or red wine. My daughter's first Brownie badge requires that she try 3 new healthful foods--- which is a problem, because by now (she's almost 8), we've tried most of the healthful foods that I think are good. Nevertheless, I tried to find some things. My first attempt was a pomegranate, which I enjoyed but she didn't really like, mostly because of the texture of the pips inside. 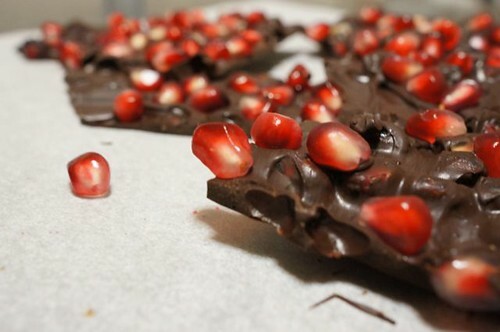 I had a little pomegranate left over, so I made the pomegranate-ginger chocolate bark from the "Try this" section. It was okay-- I think I underestimated the amount of candied ginger, or my ginger has lost its oomph. The pomegranate seeds are good with the chocolate, making nice, juicy bursts-- but I think I would rather have nuts and ginger! Also, although it did look good, I don't think it would keep well enough to make a really good Xmas gift. So, tasty but probably not on my "forever" list. I am beyond shocked and my husband is beyond thrilled that these worked. Baked 2 tonight and then left the rest in the freezer for another night. Any comments on the recipe? It took an awful long time...almost 10hrs from start to finish. I find that bread at my house rises much slower than at the rate indicated on any recipe. I usually put my bread to rise in the oven with a pot of hot water under it and it is the ONLY way I can get it to work. Even with this controlled enviroment I am often disappointed with the results. I found the recipe easy to follow and it is really nice that we can bake a couple at a time and have them fresh and hot from the oven. kg, those look GREAT!! Beautiful work-- and now you have a handy snack in the freezer! Without your encouragement I would not have made these. I am jus so traumatized by my experience with yeast that I am really reluctant most of the time to make any breads. It was a good experience and a good excuse to stay home all day. We had crappy weather and so it was easy to stay inside tending to these.